Common Refrigerator Problems You Can Repair Yourself! Refrigerator having problems? There are many different problems a refrigerator can have. The most common issues are Refrigerator Making Sounds, No Power, Not Cooling, Dirty Door Gaskets, Fridge is Noisy, Door left Open, Ice Maker Not Working, Water Dispenser Not Working, Water On The Floor, Making Noise, Water Filter Change Causes Problems, and more. We list all these fridge problems and how to fix them yourself. Don’t call a repair service, DO IT YOURSELF! REFRIGERATOR ICE MAKER PROBLEM = The ice maker is not making any ice or NO ICE. -Is the refrigerator connected to a water supply? -Is the water supply shutoff valve FULLY OPEN? = Connect refrigerator to water supply and make sure the water valve is open. -Is the water line to refrigerator bent? = A bend in the water line will reduce the water flow. Replace the water line if bent or damaged. -Is the ice maker turned ON? = Make sure the wire shutoff arm or the switch is in the ON position. -Is the refrigerator newly installed? = Wait 24 hours for ice production to start. Wait 72 hours for complete ice. -Is the freezer door properly closed? = Close the freezer door completely. -Has there been a large amount of ice removed? = Wait 24 hours for the ice maker to make more ice. -Is an ice cube stuck in the ice maker ejector arm? = Remove the ice cube from the ejector arm. -Was a water filter recently installed on the refrigerator? = Remove filter and operate the ice maker. If the ice volume goes up, the filter is most likely clogged or was not installed on the filter housing correctly. Replace the water filter or reinstall it the correct way. -Do you have an RO or reverse osmosis water filter system connected to your cold water supply? = This may lessen the water pressure and cause issues with ice cube production. REFRIGERATOR ICE MAKER PROBLEM = The freezer ice cubes are hollow or very small! -This shows that you have low water pressure going to the ice maker. = Is water shutoff valve not fully open? Turn the water shutoff valve fully open. -Is there a bend in the water supply line? = A kink in the water line will reduce the water flow. Replace the water supply line. -Is a water filter installed on the refrigerator? = Remove the water filter and use the ice maker. If the ice volume goes up, the filter is most likely clogged or was not installed on the filter housing correctly. Replace the water filter or reinstall it the correct way. -Have an RO or reverse osmosis water filtering system connected to the cold water supply? = This can decrease the water pressure to the ice maker. REFRIGERATOR ICE CUBE PROBLEM = The ice has a bad smell and or is gray color! -Do you have brand new plumbing connections? = New plumbing connections may cause gray or bad smelling ice. -Ice cubes have been in bin too long? = Throw away the ice cubes. Wash the ice bin out and let 24 hours go by for the ice maker to make more ice cubes. -Possible odor on the ice cubes has been transferred from food? = Try to use moisture proof packages to store your food. -Is there hard water and minerals like sulfur in the water? = A new water filter needs to be installed to remove the smelly minerals. -Do you have a water filter installed on the refrigerator? = Gray ice cubes shows that the water filtering system needs to be flushed. Flush the water supply system before using a new water filter and replace the water filter when indicated. REFRIGERATOR WATER DISPENSER PROBLEM = The water dispenser does not dispense water! -Is the refrigerator connected to the water supply and the water valve is turned fully open? = Connect the refrigerator to the water supply and turn the water shutoff valve fully completely open. -Is there a bend in the water supply source line? = Straighten or replace the water supply line. -Is the refrigerator a new installation? = Flush and fill the refrigerator water supply system. -Do you have proper water pressure? = Is the water pressure 35 psi? = The water pressure in your house will determine the flow from the dispenser. -Did you install a new water filter on the refrigerator? = Remove filter and operate dispenser. If the ice volume goes up, the filter is most likely clogged or was not installed on the filter housing correctly. Replace the water filter or reinstall it the correct way. -Is the refrigerator door closed completely? = Close the door! If the door does not close completely check the door seal. -Do you have RO reverse osmosis water filter system connected to the cold water supply? = This may decrease water pressure to the water dispenser. REFRIGERATOR WATER DISPENSER PROBLEM = Water leaks from the water dispenser! -If a few drops of water come out after dispensing water, this is normal. -Is the cup not being held underneath the water dispenser long enough? = Hold the cup under the water dispenser 3 seconds after releasing the water dispenser lever. -Is the fridge a new install? = Flush the water system. -Did you recently change the water filter? = Flush the water system. REFRIGERATOR LEAKING WATER PROBLEM = Water is leaking on the floor near the base? 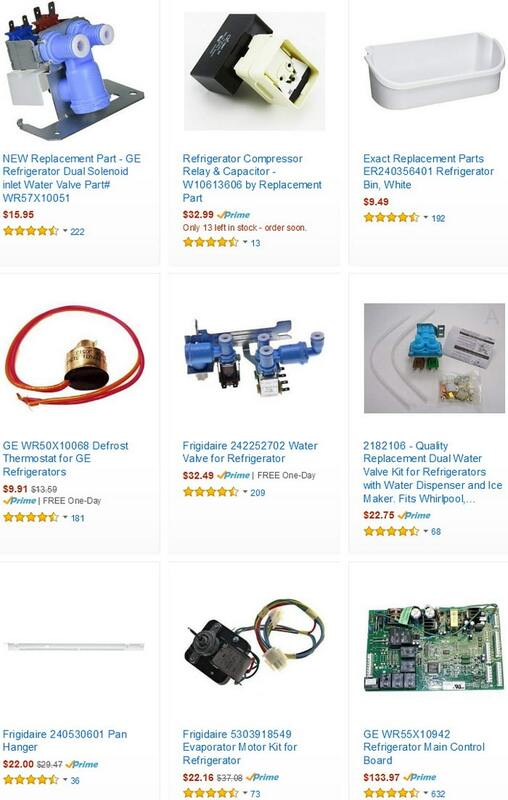 -Be sure all the water dispenser tubes and the connections are tight. -Check behind refrigerator and make sure the water inlet valve is not leaking. REFRIGERATOR WATER TEMP PROBLEM = Water from the water dispenser is warm! -Water from the dispenser is chilled. = Give the refrigerator time to get to temp and chill the water. -Is the fridge a new install? = Wait 24 hours after installation for the water supply to completely cool. -Have you recently dispensed a large amount of water? = Allow 24 hours for water supply to cool. -Has water not been dispensed recently? = The first glass of water may not be cold. Dump the first glass of water. -Is the refrigerator connected to a cold water supply? = Make sure the fridge is connected to a cold water supply and not hot water supply. REFRIGERATOR NOISE PROBLEM = The refrigerator is noisy or making noise. -You may hear noises from a newer refrigerator that you did not hear from an older fridge, this is normal. REFRIGERATOR SOUND PROBLEM = Buzzing Sounds. -Buzzing noise can be heard when the water inlet valve opens to fill the ice maker, this is normal. REFRIGERATOR NOISY PROBLEM = Pulsating Sounds. -The refrigerator cooling fans and or the compressor are adjusting to maximize efficiency, this is normal. REFRIGERATOR SOUNDS PROBLEM = Hissing and Rattling Sounds. -You may be hearing the flow of the cooling refrigerant, this is normal. -You may be hearing the movement of water in the water lines inside the fridge, this is normal. -Is there any items on top of the refrigerator that may me rattling? REFRIGERATOR PROBLEM SOUNDS = Sizzling and Gurgling Sounds. -You may be hearing the water dripping on the heater during the defrost cycle, this is normal. REFRIGERATOR NOISE PROBLEM = Popping Sounds. -You may be hearing the contraction or the expansion of inside the fridge walls, this is normal. REFRIGERATOR WATER PROBLEM = Water Running Sounds. -You may be hearing the ice that melts during the defrost cycle, water runs into the drain pan, this is normal. REFRIGERATOR CRACKING SOUND PROBLEM = Creaking and Cracking Sounds. -You may be hearing the sound when the ice is ejected from the ice maker mold, this is normal. REFRIGERATOR PROBLEM – WILL NOT TURN ON = The refrigerator will not turn ON or RUN. -Circuit breaker tripped? = Replace the fuse or reset the circuit breaker. -Are the ON OFF controls turned on? = Be sure the refrigerator controls are on. -Is the power cord unplugged? = Plug the refrigerator into a power outlet. -Is power outlet working? = Plug in a light to see if the power outlet works. REFRIGERATOR PROBLEM NEW INSTALL = New refrigerator install – Not cold yet? -Let your new refrigerator run for 24 hours following installation. REFRIGERATOR COMPRESSOR MOTOR PROBLEM = The motor/compressor is always running or ON. -A newer refrigerator can run longer than your old one as it has a highly efficient compressor and cooling fans. -Your refrigerator may run longer if the room is hot. -Your refrigerator may run longer if a big food load was added. -Your refrigerator may run longer if the doors are opened too often. -Your refrigerator may run longer if the doors have been left open. REFRIGERATOR DOORS PROBLEM = The fridge doors will not close properly. -Door blocked open? = Move food packages away from door. -Bin or shelf in the way? = Push bin or shelf back in the correct position. REFRIGERATOR DOOR PROBLEM = The refrigerator doors are hard to open! -Door gaskets dirty or sticking? = Clean the door gaskets and surfaces with soap and water then rinse and dry. REFRIGERATOR DOOR OPEN PROBLEM = The refrigerator door is opened many times or door was left open? -When fridge doors are opened frequently it allows warm air to enter refrigerator. = Minimize door opening and always make sure doors are completely closed. REFRIGERATOR FOOD LOAD PROBLEM = Large load of food or drinks added? -Allow a few hours for the refrigerator to get back to normal temp. REFRIGERATOR TEMPERATURE PROBLEM = Temperature controls set correctly? -Adjust the controls to a colder setting. = Check temp in 24 hours. REFRIGERATOR MOISTURE PROBLEM = There is interior moisture buildup in the refrigerator! A small amount of moisture buildup is normal. = A humid room will cause extra interior moisture. REFRIGERATOR HUMIDITY PROBLEM = Refrigerator is in a humid room or environment? -A humid room will contribute to interior moisture buildup in your refrigerator. 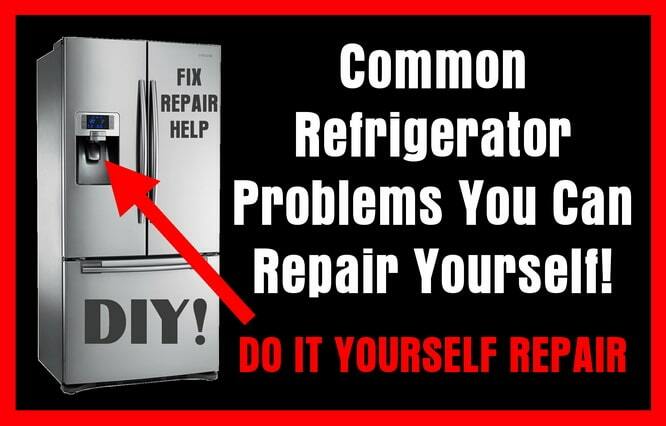 Need help with a problem with your refrigerator? Please leave a comment or question below and we will be happy to help! Temp says 76 degrees but fridge is freezing drinks! When I add frozen foods to the freezer on my fridge are ffhb2740pe5a French door bottom freezer the temp starts raising and seems to thaw everything. Only 2 years old. No error codes visible how do run diagnostics on this product or what may the solution to this problem ? Please help don’t want to discard and buy a different name brand if I can save it. GE fridge, model # GFW28HGHBWW. The light on the control panel will not turn off and when I push the water or ice, nothing dispenses. The fridge and freezer are working fine, it’s just the control panel that went wacko! Any suggestions? Much appreciated! GE side by side refrigerator which is leaking water from the freezer side onto the floor. Has been doing this sporadically for two years. I can put down towels down but it seems to puddle right on the floor under the left freezer side and no repair man says it is fixable. I don’t believe them, just feel they want to sell a new item. With a GE side-by-side refrigerator…. If water appears on the floor it could be a clog in the defrost drain tube. The usual evidence of a clogged drain in a side-by-side refrigerator is ice under the bottom basket in the freezer compartment. In addition to a puddle of water on the floor. Check to see if there is a clog in the defrost drain tube.